Historically symbols have been used to transcend language and culture and to communicate volumes with one simple icon. There are the modern universal symbols we find at airports and other public facilities . We have yellow ribbons, pink ribbons, rainbows, lapel pins and an endless list of other shorthand ways of identifying ourselves and our allegiances. What people of peace lack is an icon of identity. The best we have is the symbol of the dove and the olive branch but because it has been in the popular culture for so long and has religious significance its use may be problematic. Global citizens of peace need a fresh symbol. I propose we adopt a universal symbol which will transcend our various flags and religious symbols which have been used to separate us from one another. 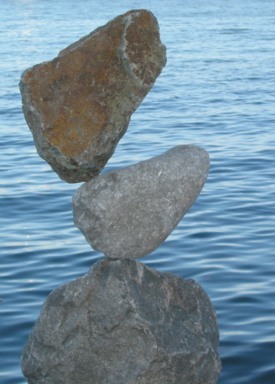 The simple cairn is an icon I am proposing. A way marker on the path of peace. 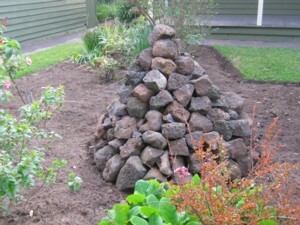 A cairn is constructed by stacking one rock upon another to mark a path which has become lost due to lack of traffic. The infrequency with which humanity travels the path of peace has caused this path to be obscured from view. We have become reliant on language and sadly language is limiting and can be divisive . Truth communicated through an icon can transcend these misunderstandings. It is true that a picture is worth a thousand words and that its meaning is more clear. This is the communication we need as a diverse community of people of peace. We can symbolize this commitment to the path of peace by constructing cairns near our homes. Waymarkers are present in societies around the globe from the native peoples of Northern Canada, the high Himalayas. and in the Middle East. They are referred to in ancient texts and we continue to marvel at the Stonehenge mysteries. The stone marker is a symbol written on our hearts and deep within the collective consciousness. Rocks are plentiful in almost all locations and remind us of the ancient dust from which we came. The humble cairn can be a marker, an identifier, a reassurance along the path of peace. We, carbon based forms, are entrusted with the care and nurturance of the beautiful creation. So may I humbly purpose that we profess our prayer for peace and our commitment to making it a reality by building cairns by our mailboxes, our walkways, or our front doors and that these cairns come to be the universal symbols of havens of peace along life's path. As we travel we can find one another and share the vision of a kingdom which transcends our religious and political boundaries. In our own communities these cairns can help us identify and unite with those who are working for peace and as we travel we can find our common family. Perhaps one day the internet will not be available to us and each of us have only a few addresses and telephone numbers by which we can connect but rocks will always be plentiful and cairns simple to construct. They can serve as silent witnesses at sites throughout the world where war is waged, planned for, or celebrated. As the army of peace, we can make our universal mark on the earth and construct humble markers on the humble path. There is no need for expensive monuments or edifices as the simple continues to confound the wise. This is just a simple proposal but it may help us to become a community - Peace on earth witnessed by cairns of hope. Originally published by CommonDreams.org • Karen Horst Cobb is a writer and artist. • Abridged and republished by permission of the author.